I’ve recently taken delivery of a Garmin Edge 500 bike computer, rather a neat piece of kit that can use GPS positioning to show speed and distance: it also has a speed/cadence sensor and a chest strap to send HR to the unit. It is ANT+compatible so can receive data from any ANT+ power sensor (I’ve got an eye on the Metrigear pedal spindle device, should it ever enter the market). 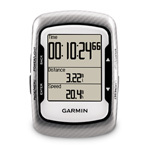 Garmin have a website to which data can be downloaded from the unit online: this requires a downloaded plug-in to facilitate upload from the Edge 500. Or so they say (more on this in a bit), and it’s only available for PC and Mac. The software is pretty limited in comparison to other apps I’ve used. While you can see graphs of power, altitude, speed and heart rate, you can’t seem to plot them in combination. Nor are there any of the very useful ways of plotting power data that some other packages offer. You can however use Garmin Connect to convert from FIT format to TCX format, which can be useful. I have been using heart rate monitors for cycle training in an effective manner over the last decade. For a few years prior to that, my usage of HRMs just consisted of looking at the heart rate. What induced my HRM-based training to really take off and lead to improved time trialling was using Pete Read's Black Book (aka The Annual Manual), which delivers a programme of turbo training sessions arranged in monthly progression. Inherent in that programme is the need to for the cyclist to know what his or her maximum heart rate is, and from this to deduce five levels (0-4). This is actually quite hard to do - it seems to me that it does take quite a bit of experience to really appreciate how hard an effort can be sustained. Recently I bought a Polar CS600X bike computer with the Polar Power meter attachment. This isn't the kind of kit I'd like to fit to a bike that will be used in the hurly burly of a time trial environment - I can't help feeling that the exposed cables would be quite vulnerable when heaving the bike in and out of car boots for example. It's also not suitable for moving between bikes, as installation, while not particularly difficult, is quite time-consuming. I chose to install the kit on the bike I keep mounted on the turbo trainer. This is the set up that I do just about all of my "real" training - the kind of training sessions which I monitor carefully using the HRM. Having now played around with the kit for a few months, I thought I'd try and get a bit more background understanding of the kinds of data analysis that power metering enables, and to take things beyond the "looking at the numbers" phase. 1. Choose your partner wisely. Other than in the events specifically designed for a senior paired with a veteran, you should be well-matched not only in fitness but in riding style. You'll get nowhere as a team if one of you repeatedly drops the other. 2. You both need to have a smooth riding style. Effective two-up riding requires the following rider to be as close as is safe to the leading rider: this obviously requires confidence that the leading rider won't have sudden changes of pace. Classic examples are where the leading rider gets out of the saddle on climbs - this results in the bike decelerating sharply. With practice and experience, a two-up team will get used to each other and stop such irritating foibles. 3. Practice changeovers. We have found that short spells of 30 to 60 seconds are ideal (following advice from Phil Corley), and that the changeover is best determined by the leading rider. We manage this with the leading rider moving to the right and easing back slightly so that the following rider moves smoothly to the front. We used to use signals to indicate the changeover was about to happen, but in practice it's quite obvious because the leading rider has a quick look to check the traffic before starting the move. 4. Avoid speaking to each other during the event. In the past we've done this and had misunderstandings because we couldn't hear what was being said (aero helmets muffle one's hearing!). Anyway, it's not a club run and you should be riding hard enough that conversation's difficult! 5. Don't worry about speed. If you're using a bike computer, don't worry about the speed. It's not in your power alone to force the pace. It's better to keep an eye on your heart rate as an indicator of your effort, and try and get a sense for how your team mate is doing. If they are showing signs of flagging, use that to moderate your speed. 6. Avoid letting gaps open up. This can happen on descents (if one rider is more foolhardy than the other, or has bigger gears), ascents (if one rider is just better at climbing in the aero tuck), or on technical sections of the course, such as bends and turns in the road. With practice you'll find you get to know when gaps might open, and learn to avoid this. 7. Stay cool. At the end of the event, if you've done badly, remember it's a team effort, and don't have a go at your team mate for some perceived shortcoming. We've seen this first hand in other teams, and it ain't pretty! By all means have a reflective post mortem on what you might have done better, or where you might have lost time, but keep it constructive. We'll add to this article periodically. Upcoming: tips and tricks realting to riding the Duo Normand - watch this space! The Duo Normand is possibly Team Grumpy's favourite time trial - the course offers a bit of everything to the rider, fast flat roads, coupled with quite technical sections. We've always been favoured with good weather at the Duo, with the exception of 2006, when the weather could fairly be described as "British" - windy and very wet. In fact usually, the biggest problem is the heat (well, for me at least, being Scottish).